Marble memorial to Lorenzo Lyons, 1886. A CALL TO THE SUNDAY SCHOOLS ALL AROUND THE ARCHIPELAGO. By the kindness of the Father, God, and Lord Jesus Christ, taken from the circle of our living was our dearly beloved father, Rev. L. Laiana, and he left behind his benevolent works for which our people are greatly indebted, as a monument [kia hoomanao] before our eyes, and before all of the Sunday School students around the Archipelago [Pae Aina]. Therefore, at the meeting of your Executive Committee [Komite Hooko], held on the 9th of November, at Kaumakapili, it was unanimously decided to erect a Marble Monument for the father, Rev. L. Laiana, and to enclose it in a fine iron fence. Elizabeth Lilikalani weds John Punua, 1905. On the 4th of this month, Miss Elizabeth Lilikalani, daughter of the Hon. E. K. Lilikalani, was joined with John Punua, by Rev. W. N. Lono, the kahu of Kaumakapili Church. Ka Nupepa Kuokoa, Buke XLIII, Helu 32, Aoao 5. Augate 11, 1905. 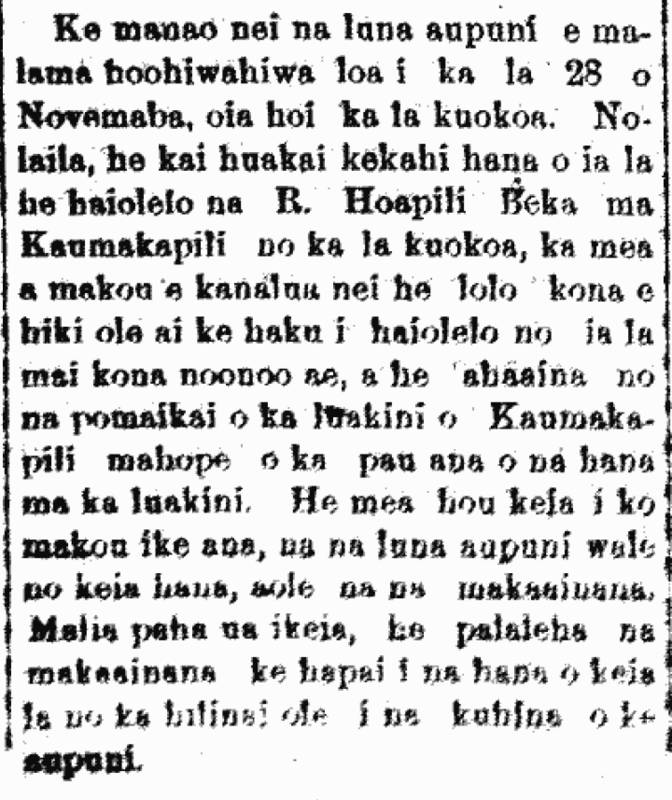 Luau at Kaumakapili Church put on by Princess Liliuokalani, 1887. 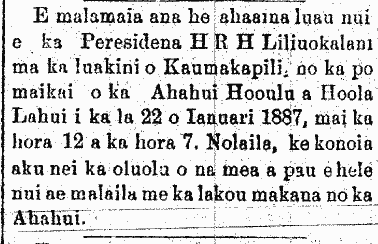 There will be a grand luau put on by the President, H. R. H. Liliuokalani, at Kaumakapili Church, for the benefit of the Hooulu and Hoola Lahui Society [Ahahui Hooulu a Hoola Lahui] on the 22nd of January 1887, from 12 to 7 o’clock. Therefore, the kindness of all is requested to come there with their donations for the Ahahui. Ko Hawaii Pae Aina, Buke X, Helu 3, Aoao 4. Ianuari 15, 1887. Mary Kealohapauole Timoteo passes away, 1908. This estimable lady, wife of Rev. E. S. Timoteo, traveling evangelist of the Hawaiian Board, having received a stroke of paralysis, breathed her last on the 6th of September, being then 56 years of age. 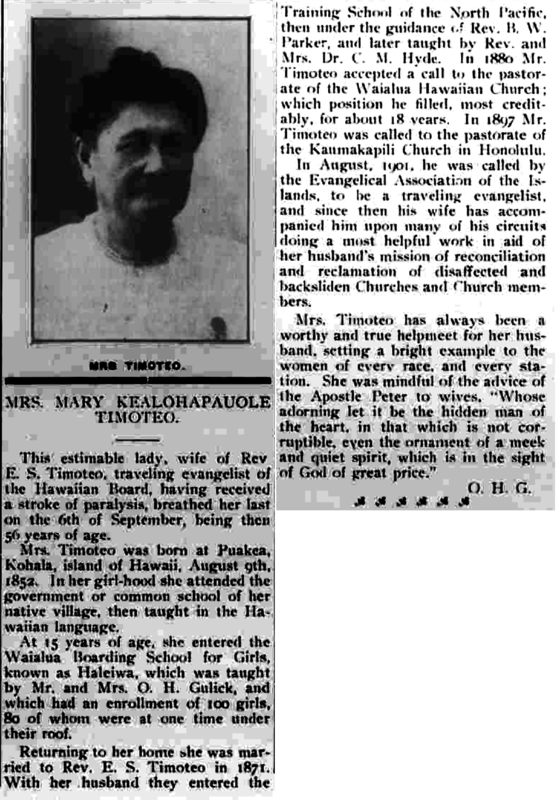 Mrs. Timoteo was born at Puakea, Kohala, island of Hawaii, August 9th, 1852. In her girl-hood she attended the government or common school of her native village, then taught in the Hawaiian language. At 15 years of age, she entered the Waialua Boarding School for Girls, known as Haleiwa, which was taught by Mr. and Mrs. O. H. Gulick, and which had an enrollment of 100 girls, 80 of whom were at one time under their roof. Returning to her home she was married to Rev. E. S. Timoteo in 1871. With her husband they entered the Training School of the North Pacific, then under the guidance of Rev. B. W. Parker, and later taught by Rev. and Mrs. Dr. C. M. Hyde. In 1880 Mr. Timoteo accepted a call to the pastorate of the Waialua Hawaiian Church [Liliuokalani Protestant Church]; which position he filled, most creditably, for about 18 years. In 1897 Mr. Timoteo was called to the pastorate of the Kaumakapili Church in Honolulu. In August, 1901, he was called by the Evangelical Association of the Islands, to be a traveling evangelist, and since then his wife has accompanied him upon many of his circuits doing a most helpful work in aid of her husband’s mission of reconciliation and reclamation of disaffected and backsliden Churches and Church members. The Friend, Volume LXV, Number 10, Page 16. October, 1908. Cornerstone of the new Kaumakapili Church, 1881. LAYING OF THE CORNERSTONE OF KAUMAKAPILI. 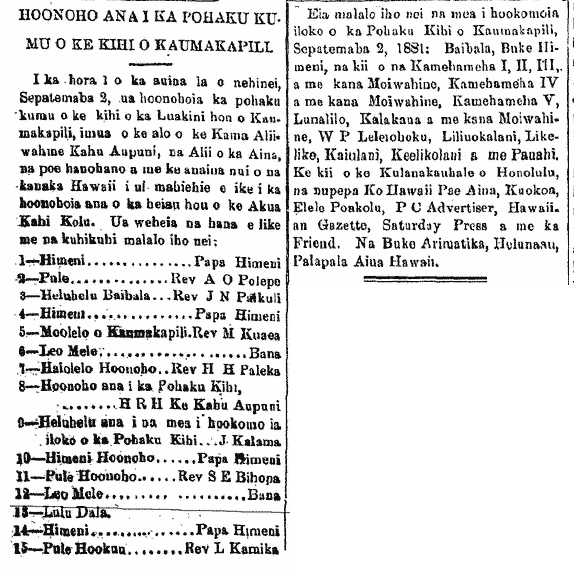 Here below are the things put inside of the Cornerstone of Kaumakapili on September 2, 1881: Baibala, Buke Himeni, pictures of Kamehameha I, II, III and his Queen, Kamehameha IV and his Queen, Kamehameha V, Lunalilo, Kalakaua and his Queen, W. P. Leleiohoku, Liliuokalani, Likelike, Kaiulani, Keelikolani and Pauahi. A picture of the Town of Honolulu, the newspapers, Ko Hawaii Pae Aina, Kuokoa, Elele Poakolu, P. C. Advertiser, Hawaiian Gazette, Saturday Press, and the Friend. The books, Arimatika, Helunaau, Palapala Aina Hawaii. Ko Hawaii Pae Aina, Buke IV, Helu 36, Aoao 2. Sepatemaba 3, 1881. The new Kaumakapili Church, 1911. Tomorrow, Sunday, the new church of Kaumakapili that stands at the corner of King Street and Asylum Road will be consecrated. This is a beautiful church built by the Lucas Brothers [Hoahanau Luka]. According to plans, the Rev. W. N. Lono and Rev. Parker, are the makua that will conduct the consecration. The choir will sing some old songs. Something great that will be witnessed that day will be the hearing of the ringing of the bell of the first church of Kaumakapili which stood on Beritania Street. The bell was forged in 1910 by Mr. Henry Hooper, and that same year it was brought to Hawaii nei and placed in the steeple of Kaumakapili. When the second Kaumakapili was built at the same location, this bell was used for meetings. When this church was consumed by fire in 1900, this bell was taken to Maemae Church where it was used until it was brought back to this new Kaumakapili Church. S. M. Kanakanui, a member of the board of trustees, will be the one ringing the bell this Sunday. Ke Aloha Aina, Buke XVI, Helu 25, Aoao 1. Iune 24, 1911. Plans for Independence Day, 1885. The heads of the nation are planning on a great celebration on the 28th of November, that being La Kuokoa. Therefore, there will be a parade on that day; a speech by Robert Hoapili Baker [R. Hoapili Beka] at Kaumakapili for independence day, the one that we are questioning as to whether he has a brain that can compose a speech for that day by himself; and a banquet for the benefit of Kaumakapili Church after the activities at the church are through. This is something new that we see, that the heads of the nation themselves are doing this, and not the makaainana. Perhaps it was seen that the makaainana were neglectful in observing this day because of their lack of trust in the ministers of the government. Ko Hawaii Pae Aina, Buke VIII, Helu 46, Aoao 2. Novemaba 14, 1885. Merrie Monarch Festival Pageant, 1964.